Do I Have a Problem With “Algae” In My Diesel Fuel Tank? Technically speaking, algae cannot grow inside of a diesel fuel tank. Algae requires sunlight to grow, so it’s impossible for it to thrive in the darkness of a diesel fuel tank. However, there are microbes like mold, bacteria, and fungus that can find their way into your diesel fuel tank and wreak havoc in it if you’re not careful. It’s important for you to prevent these microbes from doing damage to your fuel and your fuel tank at all costs. Microbes can set up shop in your diesel fuel tank anytime a significant amount of free water is able to work its way into the tank. The microbes need both food and water to survive, and the diesel fuel and water give them everything they need to grow their colonies. Within a relatively short period of time, microbe colonies can make your diesel fuel unusable and force you to pay for expensive repairs. While some times you can’t look directly into a diesel fuel tank to see microbe growth, there are some relatively simple ways to tell if you have “algae” growing in your tank. You can keep an eye on your fuel filters and track how often you need to replace them. Fuel filters may plug quicker than normal when microbes are present in your fuel. You can also run tests on your diesel fuel tank on a regular basis to see if there are microbes in it. These tests will let you know whether or not you need to worry about a microbe problem. If you find that you do, in fact, have algae sludge building up in your diesel fuel tank, the first thing you should do is remove the water and clean your tank out. 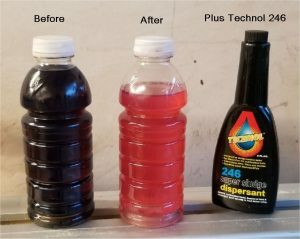 Dieselcraft can provide you with the Technol® 246 Fuel Tank Cleaner you need to break up algae sludge and eliminate it from your tank. We can also help you test your diesel fuel to see what kind of condition it’s in as you move forward. Call us at 772-215-8087 on the East Coast or 530-613-2150 on the West Coast today to order the products you’ll need to test and treat your diesel fuel.